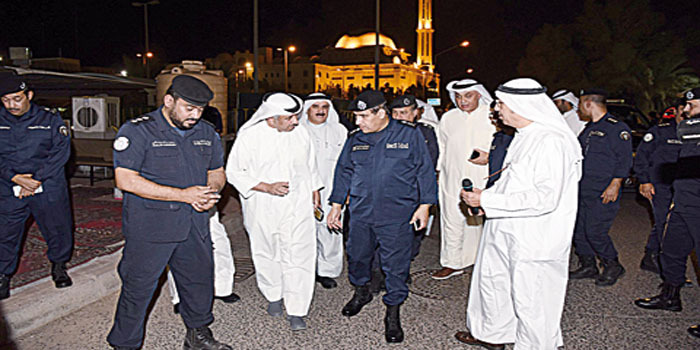 The interior ministry announced on Wednesday the implementation of a plan for safeguarding husseiniya gatherings during the Islamic month of Muharram, which started Tuesday. In line with the directives of Deputy Prime Minister and Interior Minister Sheikh Khaled Al-Jarrah Al-Sabah, Undersecretary Lt Gen Essam Al-Naham, accompanied by Assistant Undersecretary for Operations Maj Gen Jamal Al-Sayegh, held an inspection tour of several husseiniyas and condolence places, MoI’s security media department said in a press statement. Naham conveyed greetings of Sheikh Khaled Al-Jarrah to the officials responsible for implementing the security plan for husseiniyas, the statement added. He inspected all patrols on all roads leading to husseiniyas, and was briefed on the readiness of security personnel for this plan, according to the statement. He thanked those responsible for husseiniyas for their cooperation and supporting security personnel. Naham asserted that MoI’s aim is to protect lives and properties, adding citizens’ security is a top priority of the ministry. He urged security personnel to be vigilant and implement firmly and comprehensively the plan. Finally, he wished Kuwait and the Kuwaiti people everlasting security and safety under the leadership of HH the Amir Sheikh Sabah Al-Ahmad Al-Jaber Al-Sabah, HH the Crown Prince Sheikh Nawaf Al-Ahmad Al-Jaber Al-Sabah and HH the Prime Minister Sheikh Jaber Al-Mubarak Al-Sabah.